Check out the following radar loop from the Storm Prediction Center, showing Alex’s outer rainbands stretching from Mexico all the way around the Gulf to Florida! The National Weather Service Brownsville, Texas radar loop shows the eye nearing land. The latest National Hurricane Center advisory says Alex’s current maximum sustained winds are at 90 mph. 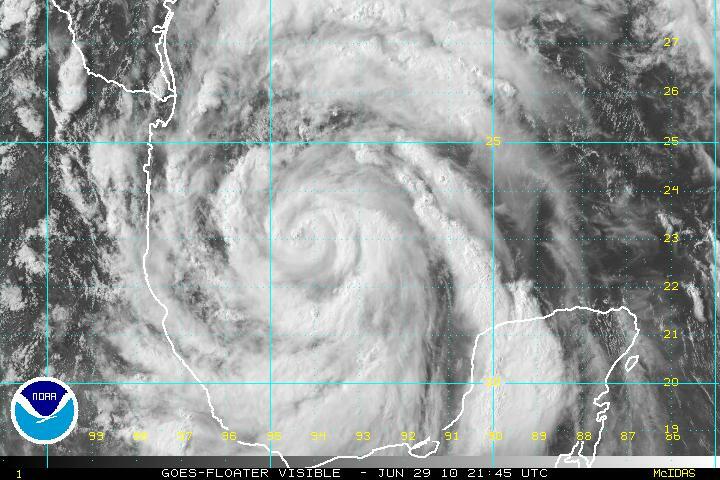 Alex is moving towards the west at 13 mph and is just hours away from landfall. Last night, Alex became the first hurricane of the 2010 Atlantic hurricane season and the first June Atlantic hurricane in 15 years. Alex is currently a Category 1 hurricane with maximum sustained winds of 85 mph and a minimum central pressure of 962 mb. Hurricane Alex is expected to make landfall late tonight as possibly a weak Category 2 (sustained winds of at least 96 mph) in far northeastern Mexico, just south of Brownsville at the Texas border. Forecast track of Hurricane Alex, courtesy of the National Hurricane Center. Alex is a large tropical cyclone; hurricane-force winds (sustained of at least 74 mph) extend outward 60 miles from the core, while tropical storm-force winds (sustained of at least 39 mph) extend outward 200 miles from the core. The right-front quadrant of a Northern Hemisphere tropical cyclone is always the most dangerous part to be, so even though Brownsville will not receive a direct hit from the eye, the rain, storm surge, winds, and tornadoes could be worse than in Mexico. In the Northern Hemisphere, low pressure systems, including tropical cyclones, rotate counter-clockwise. Thus on the right side of a cyclone, with respect to its motion, winds will be stronger than on the left side, as the rotational speed combines with the forward speed (on the left side, the winds are weakest, as the direction of rotation is opposite from the direction of motion). These stronger winds on the right side of a tropical cyclone additionally result in more water being pushed towards land, thus the storm surge will be the worst on the right front side (as it makes landfall). 1745 UTC (12:45 pm local time) visible satellite image of Hurricane Alex, courtesy of the National Hurricane Center. 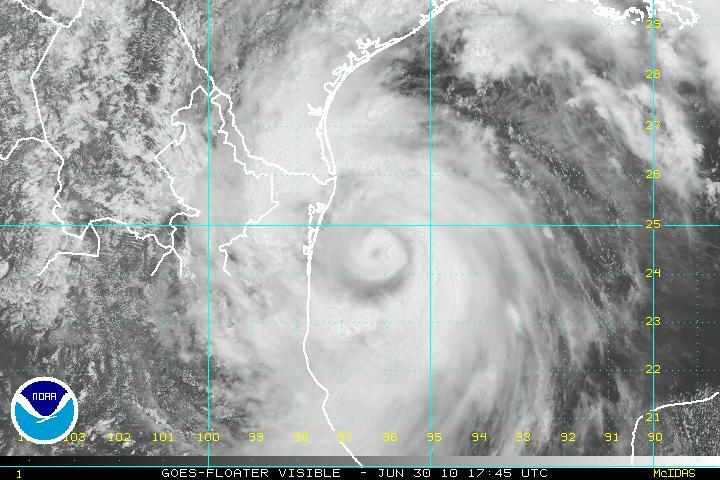 An eye is starting to form, indicating strengthening. A tornado watch was issued by the Storm Prediction Center this morning for southern Texas, and so far three tornadoes have already been reported around Brownsville, as the outer rainbands of Alex are already coming on shore. The outer rainbands are made up of multiple severe thunderstorms, so supercells are often found in this area if the wind shear is great enough (friction as the cyclone comes ashore contributes to greater wind shear). Tropical cyclone tornadoes do not tend to be as strong as tornadoes of the Great Plains, largely because shear is not as high. Lightning, also, is not very prolific in tropical cyclones, partly because there is not as much ice above a warm-core system (ice is needed to create an electric field). For the latest information on Hurricane Alex, check out the National Hurricane Center and the Brownsville National Weather Service! This week’s post in the global weather and climate series features Brownsville, Texas (click for a Yahoo! maps link). 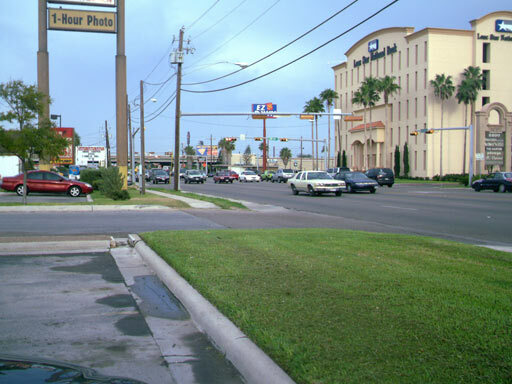 Brownsville, Texas (Boca Chica Blvd). Courtesy of Wikipedia. The southernmost city in Texas, Brownsville is located on the US/Mexico border (marked here by the Rio Grande), just a few miles from the Gulf of Mexico. Brownsville’s history stretches back to 1845, when construction on a fort was begun at the Mexican border. During the Civil War, Brownsville was used as a smuggling point for Confederate goods to Mexico and cotton to Europe. On Christmas Day 2004, Brownsville had its first measureable snow in 109 years, with 1.5 inches (3.8 cm) on the city’s first White Christmas. Today, Brownsville remains an important shipping point. Brownsville is home to 139,722 people (337,227 in the metro). Current weather: As you may or may not be aware, Tropical Storm Alex, the first named storm of the Atlantic hurricane season, is soon expected to become a hurricane and make landfall Wednesday night as a Category 1 hurricane, somewhere from Brownsville to the northeast Mexican coast. The National Weather Service issued a hurricane local statement this morning for the Brownsville area: “THE PRIMARY IMPACT FOR ALL OF DEEP SOUTH TEXAS WILL BE INLAND FLOODING FROM 12 TO 18 HOURS OF TORRENTIAL RAINS…WITH SIGNIFICANT WIND DAMAGE IMPACTS MORE LIKELY TOWARD THE COAST”. They emphasize that people should not focus on the forecast track, as the storm can make landfall anywhere within the National Hurricane Center’s forecast cone, and even if the storm makes landfall elsewhere, it can still be wide enough to affect many surrounding people. For more information on Brownsville, here’s a link to Wikipedia. For weather maps and information on current and forecast Brownsville weather, see the Brownsville National Weather Service site. Next Tuesday I plan to take a look at the climate and weather in another part of the globe. As always, if you have any comments or suggestions for future cities, please leave a comment on this post! This week’s post in the global weather and climate series features Amundsen-Scott South Pole Station, Antarctica (click for a Yahoo! maps link). 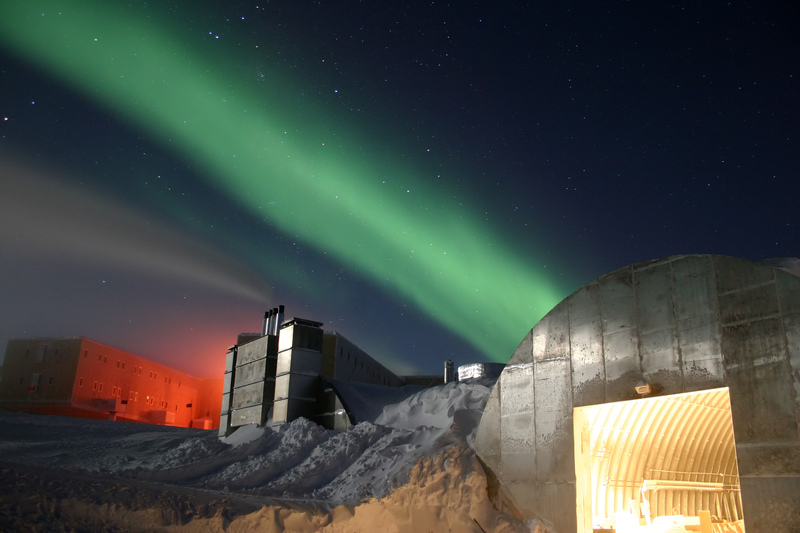 Amundsen-Scott South Pole Station, Antarctica, during the winter (the Aurora Australis is seen in the sky). Courtesy of Wikipedia. Located at the geographic South Pole (90 °S, 0 °E), the Amundsen-Scott South Pole Station is a US research station that is home to over 200 people in the summer and several dozen in the winter. The sun only rises once a year, on the September equinox (first day of spring for the southern hemisphere), and only sets once a year, on the March equinox (first day of fall for the southern hemisphere). Antarctica is the coldest, highest, windiest, driest, and iciest continent on earth. Current and forecast weather: Currently it is winter at the South Pole, and the temperature right now is -97 °F, with snow falling. Keep in the mind the sun has not risen in 3 months and will not do so for another 3 months, so there is no insolation for the research station at present. You can see the current and forecast weather at the South Pole on the Weather Underground page here. For more information on Amundsen-Scott, here’s a link to Wikipedia. Next Tuesday we’ll be back to looking at the weather and climate in another part of the globe. As always, if you have any comments or suggestions for future cities, please leave a comment on this post! The new Green Sky Chaser site is now up (most of the URLs are still the same) – go and check it out! I meant to have it uploaded last night, but of course there was a hiccup when I started transferring files, so part of the old site was deleted while the new site would not upload, and then I was not able to connect to the server for quite some time. The server just started cooperating, though, so now it’s done…I apologize for any problems you may have experienced in accessing the site over the past several hours. Thanks for your patience!